Dunno if I’ve shared this or not, but after my Ex moved out, our kids and I moved in with my Mom, Dad and college student sister. They made a home for us within their home, a recurring theme in my life, as I come to realize that I really like having a lot of heartbeats under my roof. The more equal, the better the flow. The more respect and privacy, you level up. Trying to keep the boys focused on the positive, my Mom instituted “My good thing that happened to me today was __________.” You had to have at least one, even if pre-teen or surly or on restriction, or on a diet (me, eternally) but you could name as many as you want. After reading a comment on a post Chooch made in Facebook today, all I can think of is, “Well. I know what my good thing is today.” Makes more sense when you know that this is, since that ritual ended long ago when our baby birds left the nest or remain in another, how I state that something bubbly-making has touched my heart. 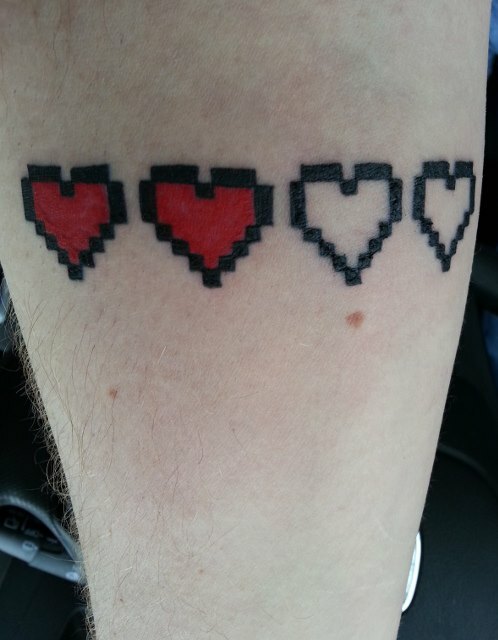 It only took 42 years, but I finally got my first tattoo! — with Vivid Muse. So, my good thing that happened to me today? Chooch’s explanation on the 4 heart containers with only 2 filled, matching tattoos we just got. I initially had a different idea in mind altogether, but when he explained why he liked this design? (whispers to myself): Thank you for loving me the way you do.